Turning to the meetings, the Trustees of the Agricultural Museum, Brook, met on Monday at the museum. I am not the only trustee from Canterbury Christ Church because another is Dr John Bulaitis. Some of you may remember John from a Nightingale Memorial Lecture a couple of years ago when he spoke on ‘The battle of the ducks’, the tithe ‘wars’ in Kent in the early 1930s. John is now busy writing a book on the history of tithe and protest nationally, but Kent and East Anglia will feature heavily, discontent being a major ongoing feature in both regions. However, on a more peaceful note, Professor Peter Vujakovic will give the Michael Nightingale Lecture this year on Tuesday 25 September at 7pm. As in the last few years, this is a joint event between the Centre and the Agricultural Museum, and it will take place in Old Sessions House. There will be a wine reception beforehand, the lecture is free and there will be a voluntary retiring collection to aid both of these charitable organisations. Peter Vujakovic is Professor of Geography at Canterbury Christ Church University and he will speak on ‘The map as biography: maps, memory and the Kent landscape’. As Peter says, J.B. Harley wrote an inspiring essay several decades ago entitled ‘The Map as Biography’. Taking this work as his starting point, Peter will explore his own engagement, as a teacher, researcher and resident, with the rich history of cartography and changing landscapes in east Kent, focusing especially on Wye and its surroundings. This sounds absolutely fascinating, so please do come along and bring your friends if you live near enough, no booking is required. 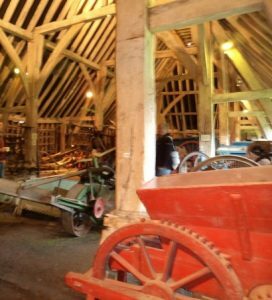 The Agricultural Museum, Brook – exploring the collection. The trustees had a full agenda on Monday, but perhaps of interest to readers here is the determination to see if the museum can engage with wider audiences. To this end more work with schools is envisaged, although the location of the museum makes this challenging except for very local schools. Among the ideas proposed was creating a Key Stage 2 and/or 3 pack for teachers and students using exhibits from the museum, and even information on the medieval barn and 19th century round oast house. The trustees are also hoping to explore further working with the School of Humanities at CCCU regarding the university’s employability module for undergraduates. This is a highly successful module and it would be great to add the Agricultural Museum as a partner to the scheme. One of the potential projects discussed was the creation of a web-based resource that would give the history of a particular piece of agricultural equipment, how it was set up and used in the past, and how it can be displayed today at the museum to highlight it most effectively for visitors. St Augustine’s Abbey ruins from the CCCU campus. Closer to CCCU, I joined Professor Louise Wilkinson when we visited St Augustine’s Abbey to meet Georgina Morton-Brown, English Heritage manager there. Georgina has been at St Augustine’s since early in 2018 and is keen to develop links with other heritage and educational organisations in the area. St Augustine’s Abbey was part of the Medieval Pageant this year and she said that they would do this again next year. Georgina is also on Louise’s 2020 Becket committee and things are coming together regarding how this major anniversary will be celebrated in Canterbury in two years’ time. 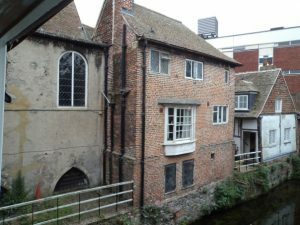 Furthermore, Professor Jackie Eales, with particular help from Mike Butler, is in the process of bringing together interested parties to celebrate Canterbury’s World Heritage site – St Martin’s church, St Augustine’s Abbey and Canterbury Cathedral. It is envisaged that this celebration, comprising several events, will take place in May 2019. 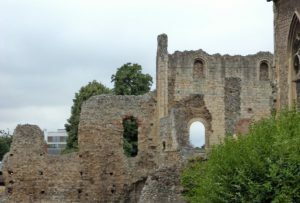 Of course, the abbey is central to this in more ways than one, and English Heritage is very much part as custodian of the site of the abbey church and some of the claustral ruins, while other custodians of the abbey site are the King’s School and CCCU. A remarkable survival – part of the original medieval wall. My third meeting in some ways comes in two parts. Firstly, Jonathan Carey the architect at Eastbridge Hospital, who is very interested in conservation, very kindly showed me around the work that it taking place in the brick fronted building over the river. Much of the structure behind is timber framed and the information that Jonathan and Rupert Austin (Canterbury Archaeological Trust) have uncovered is fascinating. However, as Jonathan said, this peeling away of recent layers is raising more questions than it is answering. 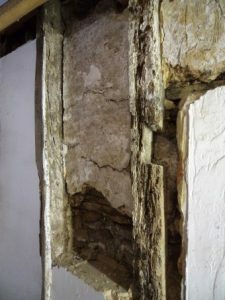 Yet the dendro date of c.1400 for the timber wall at the west end of the building is useful because it helps to provide a chronology of building works – just as in archaeological excavations stratigraphically the more recent is higher than the older deeper layers. Among the finds Jonathan showed me was daub infilling of the timber framing and a very clear carpenter’s mark on one of the timbers. Just what some of these rooms over the river were used for when constructed is far from clear, although whether they were used for storage and if so of what remains conjecture. 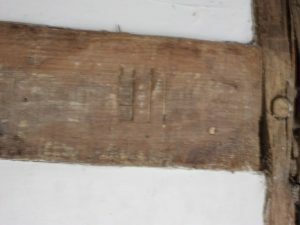 Note the carpenter’s mark on this wall timber. In part such issues are not helped by the limited survival of the hospital’s archives. Yes, the hospital has a great collection of early charters – primarily from the first century of its existence, but the medieval accounts are woefully meagre. This is not unusual, such records seen as ephemeral within a short space of time, and even the later records have been drastically pruned by masters, including into the 20th century. Nevertheless, working with Cressida Williams from the Canterbury Cathedral Archives and Library, who has provided numerous images, the text and illustrations have hopefully been finalised today for the new set of pop-up banners that the Eastbridge Trustees have commissioned. 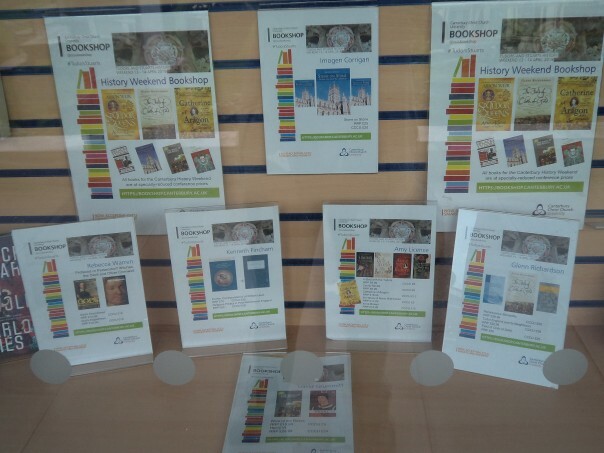 These tell the story of the hospital from its beginnings in the late twelfth century through to today, and hopefully will give visitors to the place a better idea of how and why it developed as it has done over more than eight centuries. Eastbridge hospital on the east bank of the river. 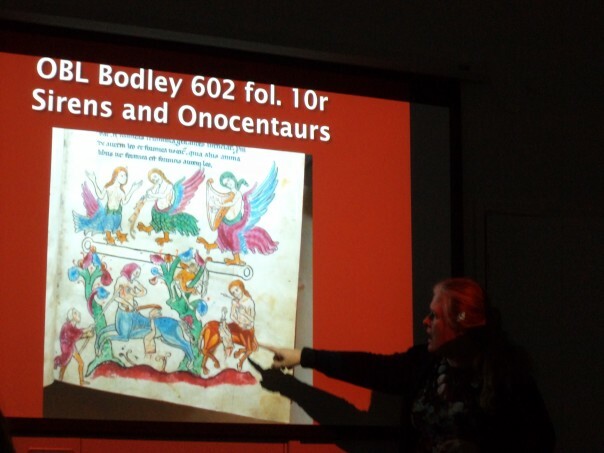 Next week I shall hope to bring news regarding Dr Diane Heath’s developing ‘Medieval Animals’ project and of a conference in Durham on ’Authority, Gender and Social Relations’ where I’ll be discussing the 1540s Prebendaries’ Plot.